It was another lively meeting last Thursday, with a wide range of topics discussed. For the trifecta, Neville continued his discussion from last month regarding 1829 Parker. He suggests that the architect was Watson who also designed Wilga. We were joined for much of the evening by James Evans who gave us an update on the Brookhouse development. We also discussed the possibilities for an HRA at the St. Francis convent property. The new season of meetings kicked off on Thursday with a good attendance. As usual, the discussion was wide-ranging and fascinating. We began as usual with our Around The Hood segment in which Eric leads us through an illustrated tour of various changes, sales, rumours etc within Grandview. This month we covered 17 properties. In many cases we looked at heritage properties that were or had been for sale; for others (such as 2111 Kitchener and 1102 Commercial) we wondered at the quick flipping of sites for huge short-term profits. We noted that three major apartment blocks on Commercial, each of which had supplied affordable rentals for decades, have now been or are being renovated with rental rates expected to increase dramatically.At 2088 Charles, we noted that this double lot was to be split as part of an HRA. Finally, we were pleased to see that 1003 Commercial (“The Peg”) which recently sold is having its roof repaired and thus seems likely to be preserved, at least temporarily. These tours always spur interesting discussions and often produce nuggets of genuine historical value. Eric has also transformed some parts of his earlier “Mechanicals and Materials” series into handy Life Hacks for Heritage presentations. Within the next short while they will appear on this site on their own page. We then spent some time reviewing and discussing the 2015-16 Centenary Signs houses. The map and the short descriptive listings are already up on the site. Some years we have had a cake to celebrate the houses; this year, Penny made peanut butter cookies which were at least as good as cake! Michael reviewed the new Heritage Register renewal project, and discussed the First Shaughnessy designation as an Historic Area. Michael doesn’t believe other areas of Vancouver will receive such a designation because, in neighbourhoods such as Greandview and Mount Pleasant, the current RT zoning seems to be working as a reasonable defence of heritage. This is not working so well, however, in commercial areas such as Main Street. Mount Pleasant Heritage Group is looking for assistance to find old pictures of the Triangle Building in their neighbourhood at Main & Kingsway. They can be contacted via their website. The next meeting is on 15th October. Jak will be presenting his database of Grandview properties. We had about twenty people at our meeting last night, with a couple of new visitors. I don’t think anyone was disappointed with all that we managed to cover in a couple of hours. Michael Kluckner gave a detailed and excellent illustrated talk that led us through the history of heritage legislation and regulation in Vancouver, starting with the first Heritage By-law (which has its 40th anniversary this year), which was a result of the controversial Birks Building demolition. He then segued into a review of the various housing styles that we can find in Grandview, focusing on the change from a front porch-based culture to one that prefers more privacy in backyards and courtyards. Michael’s talk was by way of a primer for our 2014 Centenary House signs project walk on Sunday. We will meet at the Britannia library at 9:30 a.m. on Sunday 23rd March. We will cover the area west and south of Britannia. Everyone is welcome to join us. We noted that Stephanie Chang, the UBC Historical Geography (GEOG 429) student who has been wortking with us, will present her paper next Tuesday. Michael and Jak are planning to go. We discussed the situation regarding Brookhouse, 1872 Parker. The news does not seem good, and we may well lose this house to demolition very soon. The meeting that several of us had with the Agnew family was described, and led to an interesting discussion about the value of family papers and photographs. Jak and Bruce described the $25,000 New Horizons grant that has now been received and is to be managed by VCN. The purpose of the project is to collect as many seniors’ stories as we can. Interviews should begin in April. Last, and certainly not least, Eric Phillips gave us a teaser about the new edition of his series, Heritage Mechanicals and Materials, that he will present at our meeting next month. The subject is Glass. He brought along a number of examples of stained glass and beveled plate, and then encouraged our attendance next month with some fascinating illustrations about the history of glass. Another great meeting; I think we are really getting into our stride now. My apologies for the delay in posting these notes; it has been a very busy week! We were joined by Vancouver City Clr. Heather Deal for the first hour. She took us through the City’s new Heritage Action Plan‘s 14 points in good detail. The Plan appears to cover everything from tightening up demolition permits to reducing the complexity of HRAs, updating the Heritage Register and changing the building code to ease heritage renovation. The conversation after the presentation was equally useful: some speakers noted that highly inflated property values in Vancouver were damaging heritage retention; that cultural mapping in the Heritage Register should be separate from architectural mapping; that just a few thousand dollars in grants could return many of the Edwardian ornamentation that flourished on the Drive; that groups like ours should be able to nominate for the Register; that fees collected for HRAs etc should be maintained for heritage uses rather than disappear into general revenue. Three specific issues were raised with Clr. Deal: (a) 1872 Parker, the Brockhouse, needs to be saved from imminent demolition. James Evans, who developed the Jeffs Residences and who was in attendance, confirmed that he was in discussions with the current owners. However, there were still issues to be solved before he can move in to save the property. This was greeted with excitement by the group. (b) The Green House next to the Cultch on Venables which Heather Redfern has stated is to be demolished. Clr. Deal stated that the City wants to save the building and they would be working to that end. (c) Astorino’s. The Group stressed the cultural importance of the building which is slated to be lost in the Boffo redevelopment. It was also noted that this is now an active performance space. Clr. Deal promised to review the situation. Clr. Deal had to leave the meeting after an hour, but it was generally agreed this had been a very useful conversation. We discussed the work that our intern, Stephanie Chang, a Geog 429 student, is working on. She is working with us to create a social and cultural portrait of the area around Woodland Park. She has to complete the project for presentation in April. Kristen Moran gave a short presentation on her extended video about heritage in Grandview. She was looking for more heritage homeowners to be a part of the video, and she received a great many names from those attending the meeting. Penny gave an update on the Centenary Signs Project. All the 2013 signs have now been collected and are being cleaned. We will continue the survey for 2014 targets in March when the weather improves. Finally, we had another episode in Eric Phillips’ magnificent Mechanicals and Materials series. This part was on heritage home heating systems. Eric took us on an illustrated trip through various fuel types — wood, coal, coke, sawdust, oil and gas. Fascinating stuff. Next month we will continue this part, looking at fireplaces, boilers and other systems. 1872 Parker Street. Craig Ollenberger gave a history of the last few years of Brookhouse, leading to the current situation where we will almost certainly lose this magnificent Queen Anne building in the next few weeks. The debate widened into HRAs and other mechanisms that might save such houses. It was agreed that we need to research the additional value of heritage houses for buyers. It was also agreed that we should invite Heather Deal to a GHG meeting to discuss an updated Heritage Register. Penny got us up-to-date on her discussions with UBC Professors about using students to assist us with our projects this winter/spring. It seems that basic research on our Centenary Celebration houses might be the best bet. It was noted the students will need hand-holding. It was agreed will determine our needs in December for a January start. Britannia is currently managing the Astorinio’s space at Commercial & Venables. It is part of the proposed Boffo properties development. It was noted that the EWaldorf and the Hollywood received demolition delays, and we agree that Astorino’s shoild get at least that. We will be pushing for a Statement of Significance to be completed. Penny will see if we can get a tour of the property. Eric Phillips gave a presentation that was an update to several of his wonderful Mechanicals & Materials series. He covered new forms of roofing materials, dealing with tin roofs, textured concrete blocks, and drywall mud. Penny and Maria and others have begun the process of walking the neighbourhood looking for candidates for our 2014 Centenary Signs project. They have already covered two of ten areas, and other walking tours start each Wednesday at 1pm from the 1700 block Napier. It was noted that some of the 2013 signs may be missing and may need to be replaced. Jak agreed to call Lance about the Permanent Signs project. Britannia is having an Open House on Thursday 28th November in the greenway. GHG is sharing a table with GWAC. Volunteers are needed. Bruce Macdonald reported on the first formal meeting of the Mount Pleasant Heritage Group — the first in what we hope will eventually be a city-wide collections of groups. A local brewery has agreed to sponsor space for their meetings. Penny reported on our finances, which are in good shape. It was noted that Jak King and Bruce will be making a history/heritage presentation at the COPE meeting on Sunday 24th November. Michael Kluckner is curating a series of historic Vancouver films at the Van City Cinema on Sunday 24th. Michael is also curating a series of Vancouver panorama photographs at the Space Centre on December 4th at 7pm. Finally, Carolyn Lair introduced us to the ASPECT program that mentors organizations on fundraising, and organizational strengths. Another very full and worthwhile evening. We started with an announcement of a heritage/history walk: Maurice Guibord will be conducting a tour of the area west of Commercial Drive on Saturday 9th November. Meet at Mosaic Park (Charles & McLean) at 10:00am sharp. Suggested donation is $10. Maurice — an excellent and experienced tour leader — has found some fascinating material from that area and the tour is bound to be of interest. The wonderful Brookhouse at 1872 Parker seems doomed. Subject to a few conditions, the City has informed the owner — Ernie Ho of FuHo Design — that his permit to demolish and rebuild will be issued in early November. They have completely disregarded the letters sent from GHG and GWAC. Only direct pressure on the owner can save it now. As a corollary to the 1872 Parker disaster, it was suggested that both GHG and GWAC write to City Council regarding the Heritage Revitalization Agreement process that seems to be so arduous that it has scared more than one owner away from saving a valuable property. We also discussed the issue of the Astorino’s building at Commercial & Venables which is part of the ongoing Community Plan (CP) issues. It was confirmed that City Council amended the Jackson Report to allow the potential development of this site (along with the Kettle, Ace of Suedes and the City parking lot) to continue even during the CP process but with “significant reduction in proposed height). We now await the developer’s proposal. In the meanwhile, we want to push for a Statement of Significance on the building as a folk-cultural artifact (it was agreed the building itself was not of the highest class) and as a performance space (especially as Britannia is now using it as such). The 2014 Centenary House signs campaign is now officially underway. Penny and Maria will be organizing selection tours to create a list of potential houses. We also discussed the “permanent plaque” program with reference to the fading that has been noticed on the Shelly’s Sign wall. Lance will investigate the issue and report back to us. Jak agreed to write a brief guide to adding material to our wiki. This will appear on this website in the next few days. Bruce reported on the Ridge Bowling Pin which he has been trying to secure for the Grandview Lanes roof. It has been purchased by Yusuf Wosk for $5,000 and is apparently stored in his backyard. Maybe we can still get it if he gets bored with it. It was noted that there is an Opne House for the Trout Lake Masterplan on Saturday. Bruce Macdonald will be giving a heritage overview at the Community Centre that morning. Finally, we thoroughly enjoyed part 4 of Eric’s marvelous series “Mechanicals and Materials“. Tonight’s was about the Hazards of Old Houses. He talked about the uses and problems with lead, asbestos, mercury, leaking underground storage tanks (apparently known as LUST to specialists), and other chemicals. Highly informative and entertaining as always. Thanks Eric! A fun and entertaining evening. We reviewed the Heritage Fair and Car Free Day experiences. It was agreed that we met a lot of people at those events, answered a lot of questions and, hopefully, enthused a few about our neighbourhood’s heritage. This led to a continuation of our discussions about offering more permanent ceramic plaques for the houses. A sub-committee (Lance, Penny, Dorothy) was struck to examine the issues (cost, price, content, attachment strategies, etc) and it will report back to the next meeting. Our big party at the Shelly’s Sign is this coming Sunday; Ann caught us up on the status of the organization and we spent some time finalising the details, filling volunteer slots, etc. Michael Kluckner gave a fascinating presentation reviewing how some developers/home owners are using Heritage Revitalization Agreements to get around the restriction on laneway houses and infill in RT zones. His example was from Kitsilano but he noted that we have similar lot sizes and issues here in Grandview. We have previously been keen on getting more Grandview houses onto the Vancouver Herirtage Register, but Michael showed how this could be quite damaging to the neighbourhood in the long run. Questionnaire responses to the draft Community Plan deadline on 3rd July. We had a good discussion about the Grandview Heritage wiki that we are developing. This will become formally open on the weekend to allow the QR code on the Shelly’s plaque to be made available. There will be a lot more info on this in the next few days –watch this space! We also discussed the fact that someone — perhaps the Commercial Drive BIA — has had signs reading “The Drive” on street signs placed throughout Grandview. It was agreed we will contact the BIA to find out how this came about. Bruce discussed his plan to salvage the 12′ bowling pin from the Ridge Bowling Lanes and to place it on Grandview Lanes. He has had preliminary discussions with the Ridge, with heritage staff at City, and with the Marino family who own GV Lanes. Bruce will keep us informed as to progress. … and ready to go. 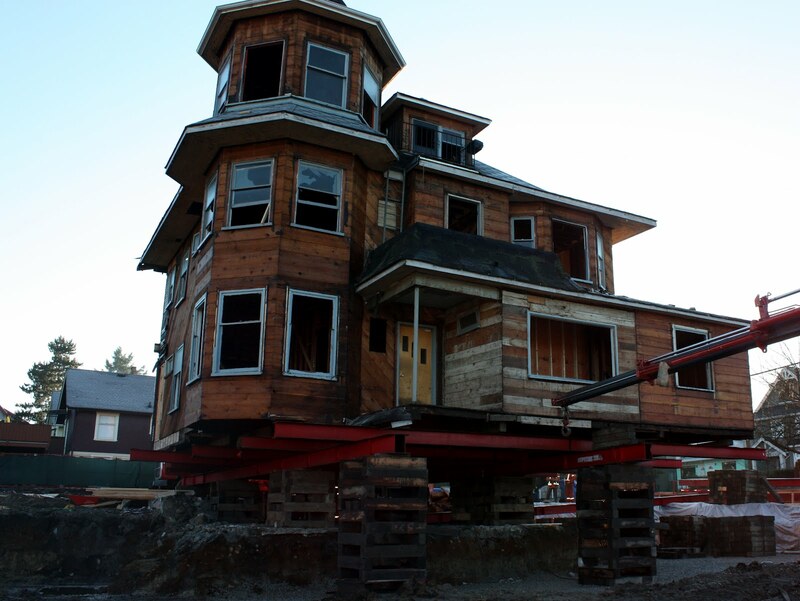 Here is the Jeffs House jacked up on rollers just before it was moved across the site at Charles & Salsbury. The Jeffs House at Charles & Salsbury is scheduled to be moved across the site tomorrow, Friday 3rd February. That should be fun!